(Lowell) I suspect it’s rare to see a mismatch of this proportion so far along in the tournament but that’s what it looked like as the Watertown boys decisively defeated Newburyport, 55-31, to take the Division 3 North title on Saturday night at the Tsongas Center. The state‘s leading scorer (Marco Coppola) paced the Raiders with twenty-one points and teammate Danny Kelly added fourteen. 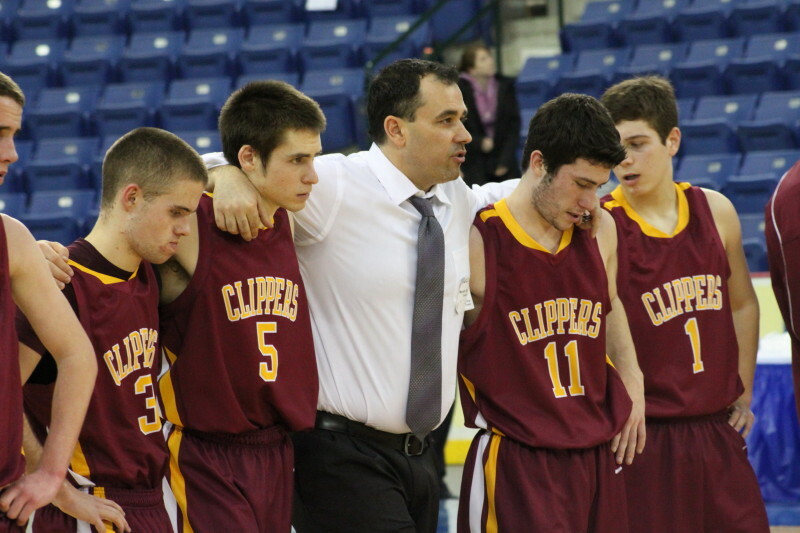 Chris Jayne finished his Clipper career with a team-high eleven points, all in the second half. 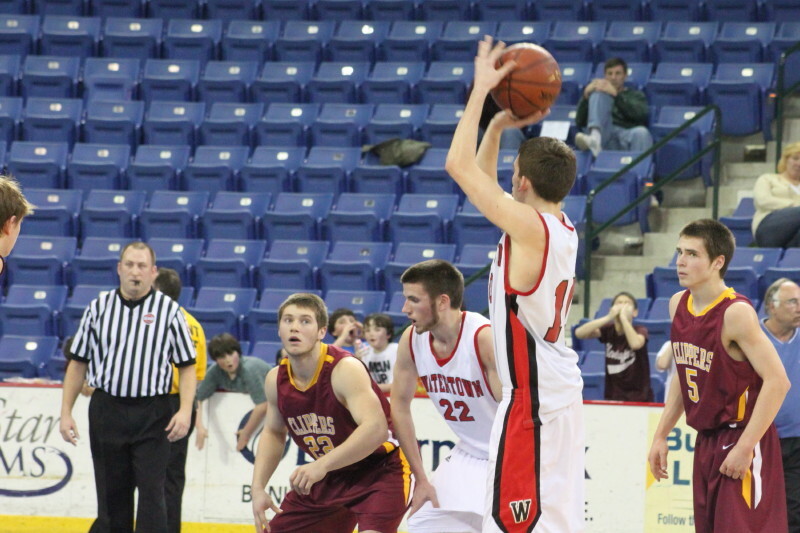 (3) Watertown shot 3-for-20 from long range and the state’s leading scorer missed all seven of his attempts from beyond the arc. Chris Jayne rushes to cover Marco Coppola in front of the Newburyport bench. Obviously, Watertown (18-5) took great care of the basketball. All five starters handled the ball like guards. They were very good at penetrating as far as they could go and then dishing to an open teammate. The Raiders had great looks all game long. On the other hand, Newburyport made uncharacteristically bad ball-management decisions over and over. Some of the turnovers led to breakaway layups while others robbed them of shot attempts. Watertown had twenty-eight more shot attempts than the Clippers! Newburyport (15-8) lost by twenty-four points in a game in which their opponent missed seventeen 3’s. The final score could have been significantly more lopsided. The teams were tied, 6-6, three minutes into this game before the Raiders ran eleven straight stretching into the second period. 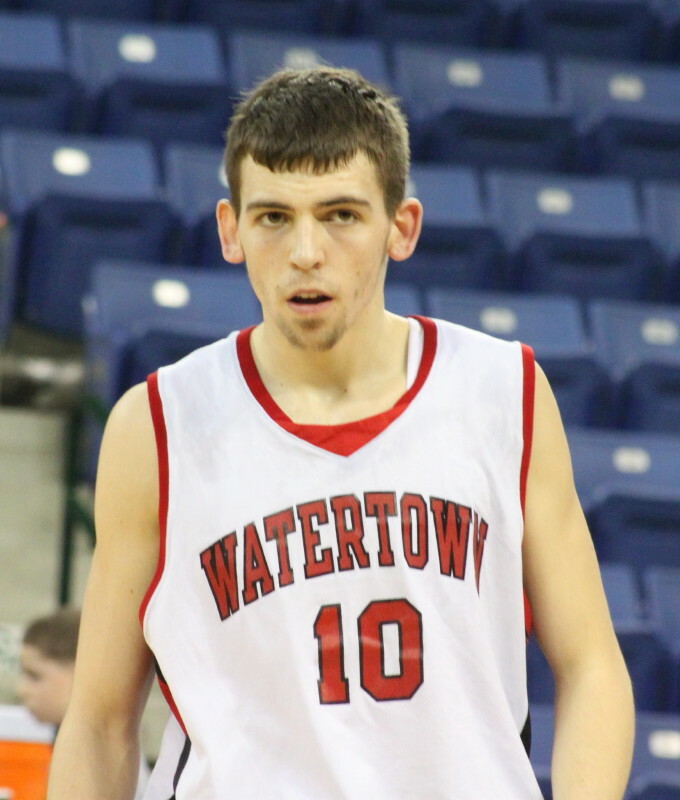 Watertown hit two of their three’s (Tyler Romanelli and Danny Kelly), got an old-fashioned three (Marco Coppola), and a layup by Connor Stockdale on an assist by Marco. This run gave the Raiders a 17-6 lead. Marco Coppola shoots a free throw. Later in the second period and into the second half, Watertown put a 17-2 stretch together over 7 ½ minutes to put this one away, 36-14, with four minutes left in the 3rd period. Marco Coppola contributed ten points and other seven were scored by Danny Kelly. The rest of the game needed to be played and was. Both teams cleared their benches. 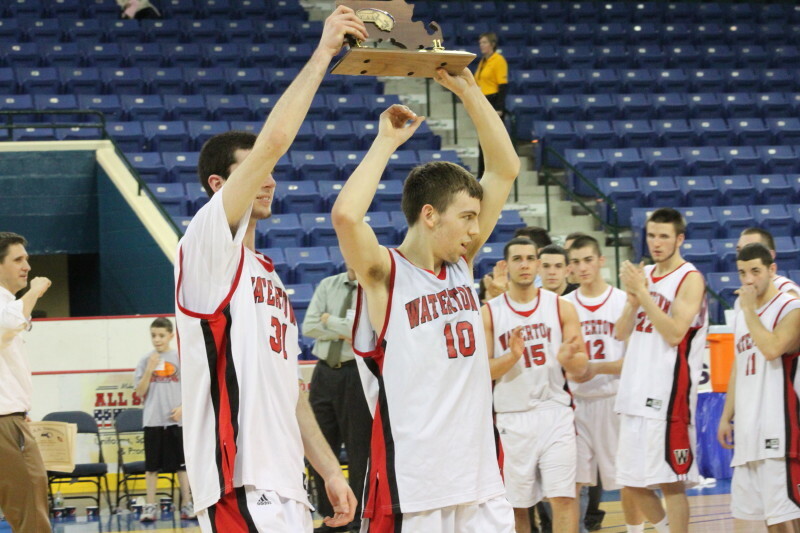 Watertown moves on to the D3 state semi-finals on Tuesday night at the TD Garden against Cardinal Spellman. I can assure you that if the Raiders get turnover numbers like they had against Newburyport and start to connect on 3-point shots, they could win two more games and be state champs again. The Raiders were state champs in 2007 and 2009. Connor Stockdale and Marco Coppola hoist the D3 North trophy. 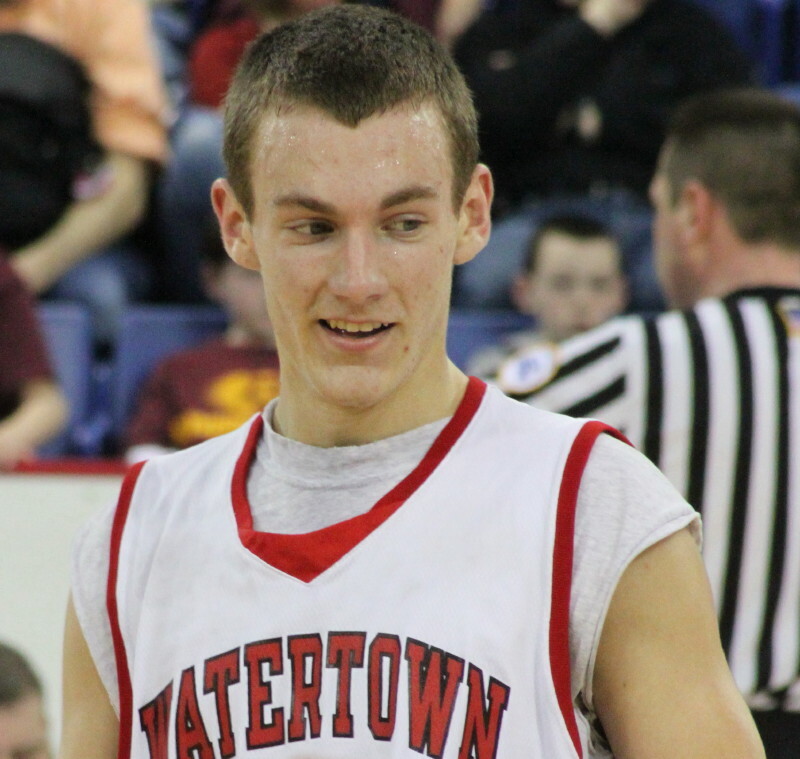 Watertown has a 98-23 record over the last five seasons and have made the state tournament fifteen straight years. Let’s just say that they’ve been good and they still are. Newburyport loses eight seniors off of their 12-man roster and will have to rebuild around the team’s lone returning starter and leading scorer (Brett Fontaine – 13.1 points per game). Coach Tom L’Italien waits with his team for the runner-up trophy.